Facebook Lead Ads are defined as an advertising format designed to increase your user database. If you use this advertising format in your marketing strategy, with the Easypromos application you can go a step further and increase the conversion of your Facebook Lead Ads campaigns by offering users to participate in a sweepstakes as a reward. 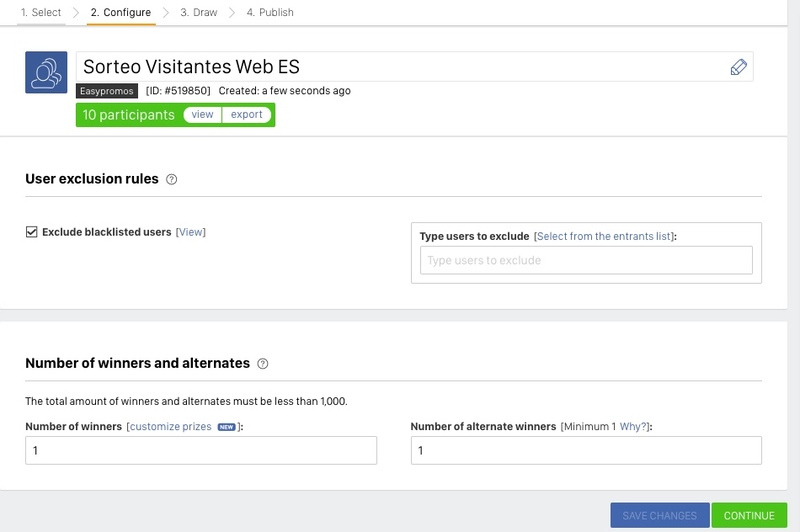 In this tutorial we explain how to run a sweepstakes among all users that have registered in your forms created with the Facebook Lead Ads format. 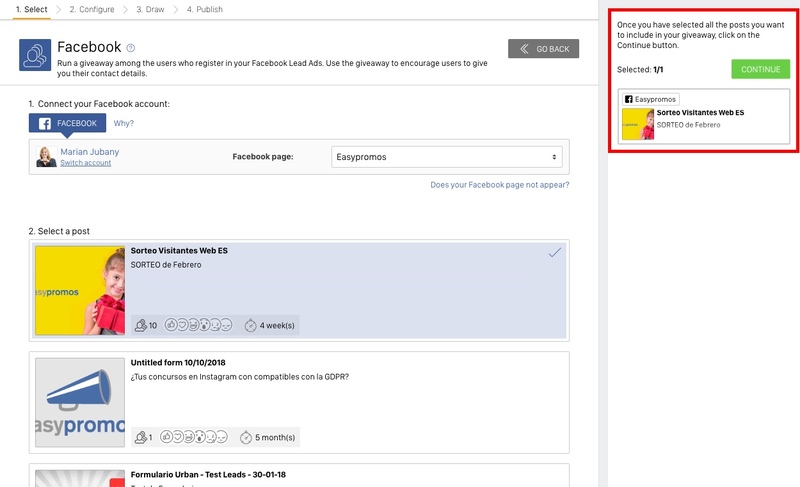 The “Facebook Lead Ads sweepstakes” tool is used at the end of the process when the participation period ends and you want to select the winners. So the first step should be to create and publish the ad on your Facebook page. And once the participation period is over, you should access your Easypromos control panel and create a new promotion to import all the leads to the application so you can carry out the sweepstakes. This is the process described in this tutorial. 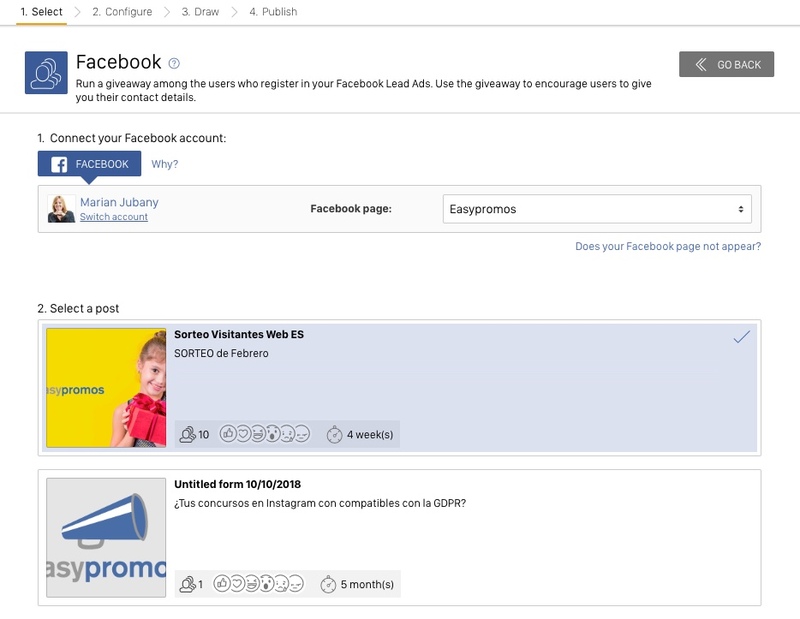 To be able to run a sweepstakes from a Facebook Lead Ads it is necessary to have a Basic PRO plan (49€ / $49 month). More information about Easypromos Basic PRO plan and all it includes. A) Your account information is located in the upper bar of the window. Use your account ID (preceded by the # symbol) to identify yourself when requesting help from the Support Center. B) This is the area where your promotions will be listed according to status: active, draft and finalized. 1. Click on “Create new promotion” button to begin setting it up. 2. Choose the “Facebook Timeline Giveaway” option. 4. The Giveaway setup screen will be displayed. 5. First you’ll be asked to log in to Facebook. 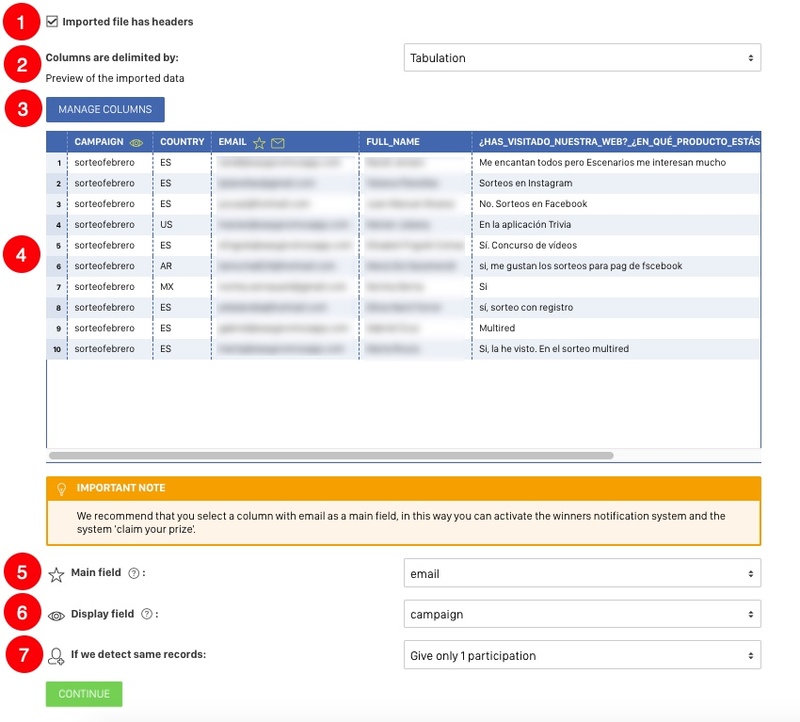 Please, log in with the Facebook account you use to manage the Facebook page where you have created the Facebook Lead Ad. If you’re already logged in, a dropdown menu will appear with a list of all the different pages you administer. Select the page on which you want to run the Sweepstakes. 1. If the imported file has headers, activate this option and it will be easier for you to identify and manage the columns. 2. By default, information will be presented with the most suitable tabulation. Manage the settings if the information is not separated by columns as it should be. 3. You can use the "Manage columns" option, which allows to combine columns as the display field. For example, if the form includes "NAME" and "SURNAME" columns, with the "Combine fields" option you will be able to show the names of participants by combining both columns. 4. You can preview how the data is being imported. Not all the records are shown; you will only see a sample. The last entry will also be included to give you an idea of the total number of rows/users. 5. Main field. This is the field used to identify the participant. It’s the one used for the random selection of the winners and for verifying duplicates. By default, the tool will present you with the field considered most suitable. 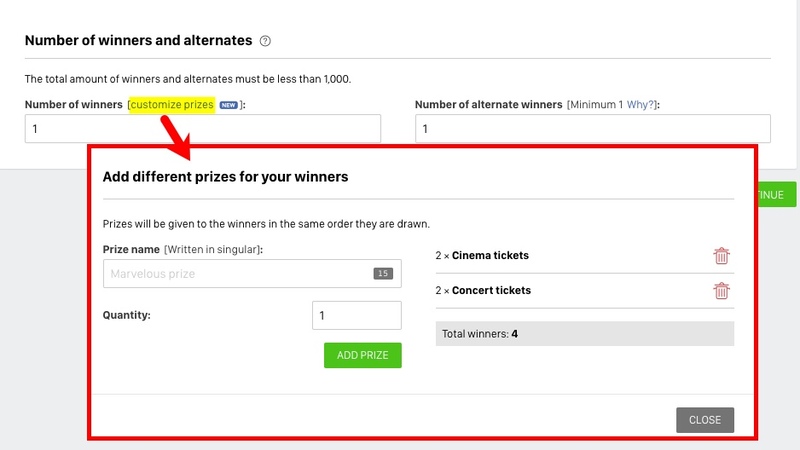 We suggest you make it the "Email" field so you can easily notify the winners via email and enable the claim you prize system so that prizewinners can identify themselves and send you more information. 6. Display field. This field will be used to publicly display the participants/winners. We recommend that you set the display field to be the "Full_Name" field, because in this way, the winners' names and surnames will be displayed on the winners page. 7. The tool will ask you how it should behave if it finds identical records in the main field. These can either be ignored or counted as additional entries. Set up the sweepstakes by adjusting these options and click on the "Import" button to start the selection of winners. You’re on the page of the open sweepstakes. Beneath the title you’ll find the number of participants and the options for viewing the list data. From here you’ll also be able to exclude participants or include them in the black list. Note: You have the exclusion option "Exclude users from the blacklist" if you want this exclusion to apply. Next, indicate how many winners and how many alternate winners you want to select. We recommend that you always request alternate winners as this will ensure that the prize fulfillment management is easier and more efficient. Clicking on "Continue" will take you to the Test Page. Note: The total amount of winners between winners and alternates must be less than 1,000. 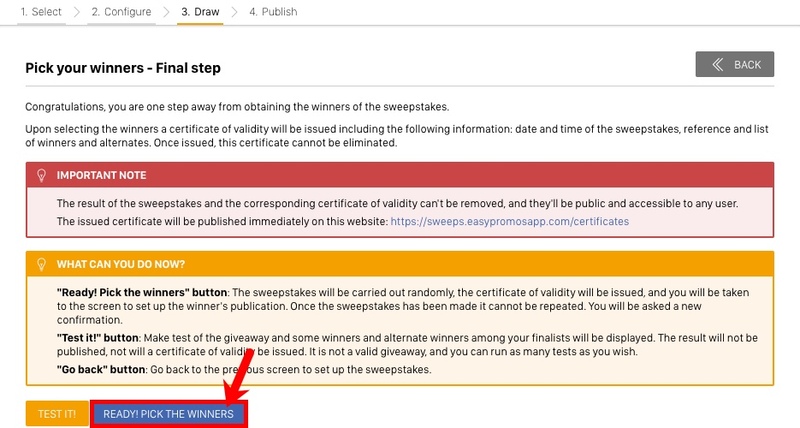 Before running the random sweepstakes you will have the opportunity to carry out various tests to see how the tool works. Clicking on “Select winners” will activate the random sweepstakes. Once the sweepstakes has been carried out it won’t be possible to repeat it. Congratulations! The sweepstakes has been completed and you should now see a screen with the results. Now you can start thinking about announcing the winners and preparing to award the prizes. Here you will be presented the list of users who have been winners and alternates of the sweepstakes. From here you can also manage the winners to replace them if necessary. Certificate of Validity URL. A certificate of validity has been issued, as the draw has been made only once and in a totally random manner. This certificate can not be modified and it identifies the draw. Share your URL with the winners so that participants see that your draw is transparent. URL of the Winners page. A microsite has been generated where the winners and alternates are presented. In this way, communicating the results will be easier for you. You can customize this page to adapt it to your brand and your needs. 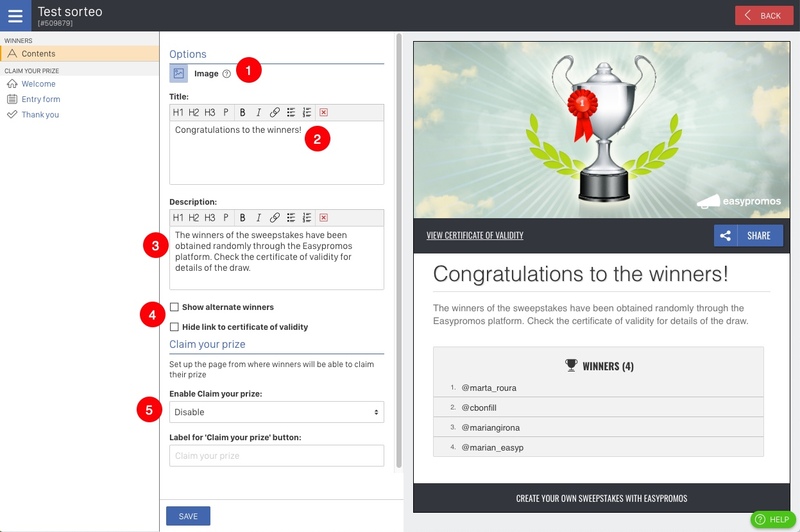 Click on the "Edit" to modify the Winners Page and customize it to fit your needs. Do you want winners to be able to claim their prize and confirm their details? If you have the email addresses of entrants then you can activate the "Claim your prize" module. This means that the winning entrant will be able to claim the prize and confirm his/her details on the Winners Page. Activate this system for a more efficient prize fulfillment management. Here we explain more about how to use this tool and the opportunities it provides. Once you have everything ready, it’s time to share the Winners Page. 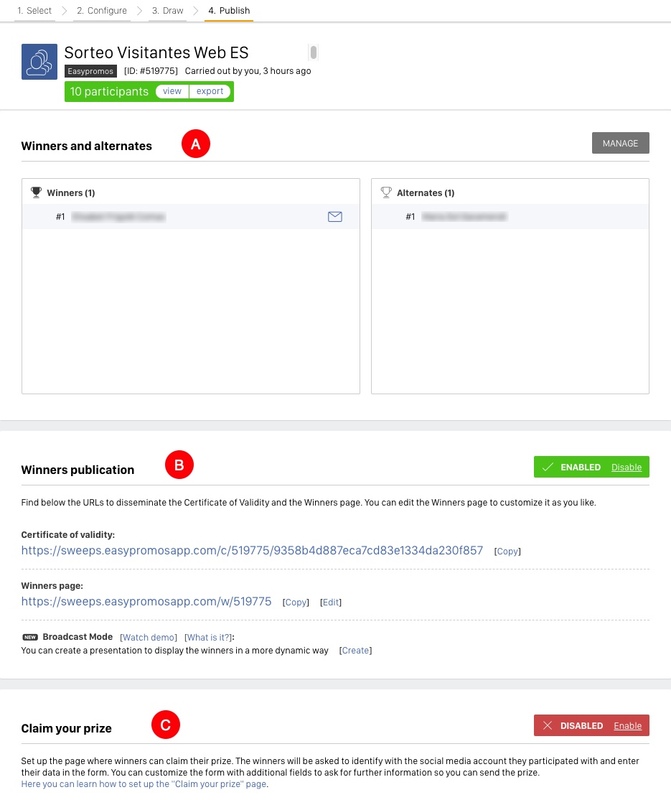 You can copy and share the URL of the Winners Page directly.